Theo Pauline Nestor (How to Sleep Alone in a King-Size Bed) is an author, blogger, and writing instructor whose latest book reads like a journey outlining one writer’s struggle for her own voice, sense of self, and comfort within her craft. 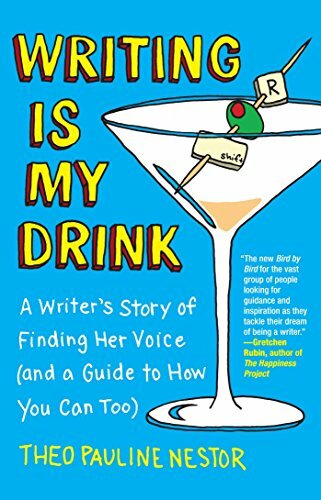 It is also an extremely helpful guide for writers of all levels to find their voice or make it that much louder. Baring her soul, Nestor foregoes her own personal shortcomings and even shame to conquer the fears and show aspiring writers just how deep and courageous they must be willing to be to get the story told. In addition to the different tips and techniques of writing that are discussed, so is the very frustrating and all too common inability to write. In “The Art of Lolling, Lounging and Loafing” many writers will finally get the validation they’ve been secretly seeking to justify all that time they spend staring into space. Ever try to explain that you’re playing solitaire because you’re trying to relax your mind for a minute? My protestations are usually met with a smug look and eye rolling; however, Nestor justly points out that the thinking process is very much an activity and only “appears” to be wasting time. She even throws in a fun exercise of writing for 10 minutes about wasting time. During her time in school, the author learned a triptych structure that helps to plant the seed of a new idea. The object is to think of an idea or word then three events or moments that match it. It’s a great tool for creating structure and brainstorming. Even in sleep, Nestor’s writing genius is at work. As a result of a dream “The 26 Minute Memoir” was born—an excellent challenge that can be used to get the juices flowing or perhaps kickstart the writing process. With its simplistic flexibility and no restrictions, a 26-minute memoir can recount a lifetime or a moment in time. One of the most relevant topics that Nestor discusses is “Imposter Syndrome,” the innate belief that we are not truly writers and that the person next to us is; that whatever we write can’t be that good or important simply because we wrote it; and therefore we must fake it as convincingly as possible lest someone figure it out. It was so comforting to learn that I am not the only one who feels this. Sure my friends and family are my biggest fans, but we’ve all seen American Idol and the caliber of contestants who believe the hype of their friends and family. . . .
Each section, whether it’s a personal story or relation of sympathetic circumstances that writers endure at one time or another, Nestor’s “Try This” section helps to alleviate self-doubt and indecision of what to write about. Her triptych exercise is something that can always be used as a touchstone in times of creative feast or famine. Nestor’s own introspection serves as fodder for her writing, but also encourages others to look deep within themselves for ideas, creativity, and even the ugly truth—that just might pave the way to literary gold. An amazing, honest commiseration from one writer to another, Theo Pauline Nestor’s memoir is captivating, motivating, and above all encouraging.